Test Sensitivity to Acids (caution: prevent damage to marble, limestone, cement. Does it need to be sealed? 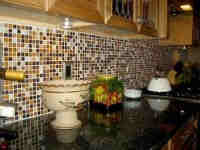 A surface that will darken under a drop of water will also stain and must be sealed. 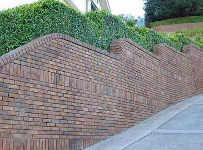 The appropriate Aldon sealer will also stop acid etching, erosion, efflorescence, flaking - and enhance the natural beauty. 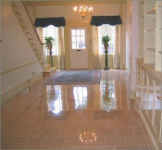 Shiny - Looks like Terrazzo, but the marble/quartz chips are in a polymer resin & marble dust binder. Also known as "composite engineered stone"
Silestone and Ceasarstone are in this agglomerate category because they are over 90% quartz chips and dust with a polymer resin binder. Varies from dense (almost slate like) to very absorbent sandstone texture. It has tones of blue, green, and purple. 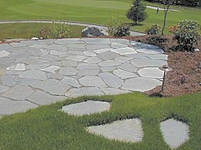 The "Pennsylvania Bluestone" variety is typically uniform blue/gray and highly absorbent. Wall or Paving Brick. Solid or Cored. Many colors and finishes. Many are similar in appearance to the clay bricks. Concrete (cement) body. 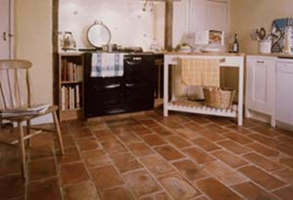 Some are known as "Encaustic Tile". They are approx. 3/4" thick with many shapes, colors, and sizes. They can be Wet and dry molded, or Extruded. 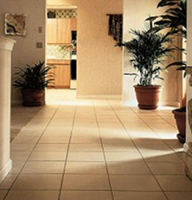 A concrete tile can look like any kind of clay tile, but must be treated much differently. Not installed, but already sealed? 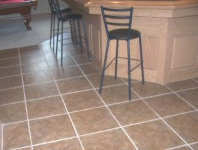 - see "Factory Sealed below"
Picture shows a Mexican tile as received from the distributor with a sealer already applied. It now has unique installation and treatment requirements. 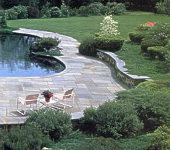 Flagstone is a generic name usually referring to sandstone, but can mean an installation design that applies to other stone. Some have crystal deposits that vary the porosity across the surface. 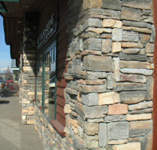 Some kinds of granite do not need to be sealed. 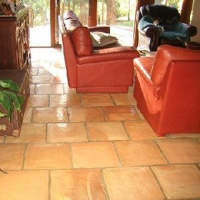 Other kinds do need to be sealed to keep staining liquids out of micro-fissures. 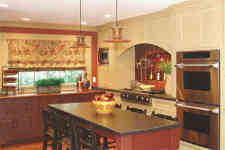 Granite comes in counter top slabs, tiles, monuments, etc. 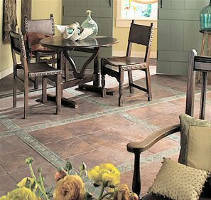 For tabletop grout issues - see "Tabletops"
This page is for true metal pieces, not a metallic "glaze". See Tile, Ceramic (clay) - Glazed for the discussion of metallic glazes. Not installed, but already sealed? 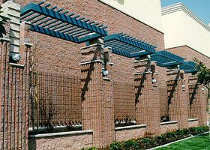 - see "Factory Sealed"
Small - square, hex, rectangle - usually with a mesh backing for easier installations. 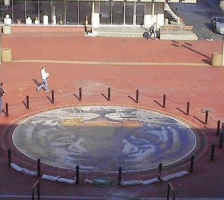 Not the thinner, more absorbent clay or concrete tile also called "pavers". Same hard fired material and color all through the body. 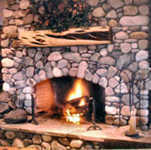 Some are zero absorption and stain proof, but that is no longer true of all as new colors and textures have developed. If it darkens from a water drop, it will stain and needs to be sealed. 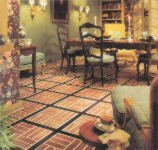 Discussion includes "Stone Look" tile. Not glazed. Same hard fired material and color all through the body. 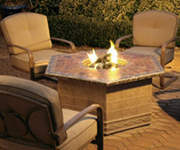 For tile tabletops - see "Tabletops"
There are many kinds of the sandstone family of stone. The name is not as important as recognizing the characteristics discussed. 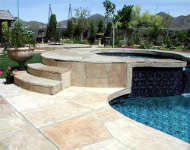 The name "flagstone" is many times referring to a sandstone. Many types and colors. 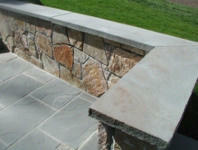 Some slates require the sealer to provide reinforcement of soft and/or flaking areas. Discussion of artworks made from all kinds of tile and stone. Cement and sand body . 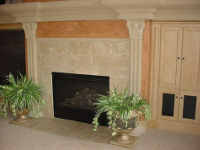 Duplicates the look of all the natural stones. Does need to be sealed to prevent fading and etching from acidic liquids. 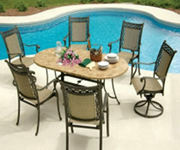 For stone tabletops - see "Tabletops"
Some of the patio furniture manufacturers using Aldon products in their production are shown here. Click their logo for their table care information. If your stone tabletop is not made by one of these, it can still be refinished and protected as discussed on each of these manufacturer's pages. 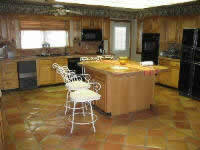 See Video for the easy refinishing process. Typically an even, light beige color. These are treated differently than Mexican Tile, but both are in the terracotta family. Many come from France and Brazil. 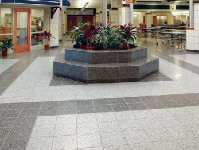 Terrazzo can be a tile, or poured in place in large sections and machine ground to a polished finish. It has a shiny, polished finish and can look like Agglomerate (see above). 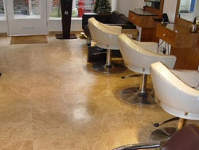 They both use marble or quartz dust & chips, but Terrazzo uses a cement binder and Agglomerate tile uses a resin binder. Colors, textures, shapes are in the thousands. 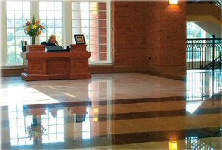 Although considered to need almost no care or protection, the new and unique glazed tiles available today do have some characteristics that should be known before installation. Metallic Glazed (fired) see above for pure metal tiles. 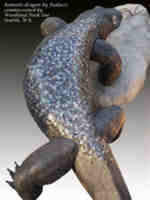 Clay body - Fired - Not glazed or coated. Each of these tiles is a category by itself - see above.